NYCC welcomed back the cast and crew of The Exorcist, to talk season two of this fan-favorite anthology series. A trio of priests – Kurt Egyiawan, Ben Daniels, and Alfonso Herrara – return in season two to confront the devil, corruption, and inner demons. This time around they’re investigating possession at a group home for at-risk foster children, run by former child psychologist Andrew Kim (played by John Cho). Kurt Egyiawan (Father Bennett) and Zuleikha Robinson (Mouse) were greeted with relief – everyone is happy to see Father Bennett alive and well. Egyiawan loves the “puzzle” piece aspect of season two as well the priest’s attempt to force the Church to deal with corruption. Ben Daniels (Father Marcus Keane) and Alfonso Herrera (Father Tomas Ortega) chatted about what scares them (they’re pretty chill, by the way), but there’s no getting around how the research into their roles has sunk into their brains. An exorcism that lasted seven seasons would have you rooting for the demon, said The Exorcist creator Jeremy Slater. He and producer Sean Crouch wanted an anthology series with “connective tissue” provided by the trio of priests. Both men also sent out a heartfelt thank you to the fans, who were instrumental in getting the show picked up for a second season. 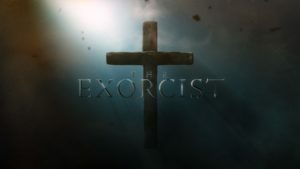 Watch the second scary season of The Exorcist on Fox, Friday’s at 9 pm, ET/PT.